That just looks depressing. Like the series they played! And so the brutal end of the season continues. First, the Mariners got swept by the Athletics in fairly ugly fashion, managing all of 4 runs in their 3 game set. The Toronto series saw the Mariners bounce back a bit, taking 2 of 3 from the Blue Jays in the "a little close for comfort" type of way. Immediately following their final game of the Toronto series, the Seattle Mariners team boarded a plane headed for Texas to play the Rangers in a 3 game series. This particular series didn't star any of the Mariners top pitchers, unless you count Jason Vargas and/or Hisashi Iwakuma. Neither pitcher did much against the Texas offense, but not a lot of pitchers this season have, so they can be forgiven. What did we take from this series? The Rangers are good and Seattle still has a ways to go on offense. Let's just see how they did, shall we? The first game saw Hisashi Iwakuma take the mound against Yu Darvish. Before the game, Iwakuma had been hot in the previous month or so, but so had Darvish. In Darvish's last 4 starts before this one, he'd gone 29 innings, allowing only 6 walks, 34 strikeouts and a 2.17 ERA. For Iwakuma, since he became a starter, he's sported a 2.80 ERA in 70 2/3 innings with 26 walks and 60 strikeouts. In Darvish's previous starts against the Mariners though, he'd been lit up brighter than the sun on a cloudless day. It's amazing the Mariners got anything going against him, what with him being so bright on the mound and all. But they did, to the tune of a 9.00 ERA in 16 innings to go along with 14 walks and 14 strikeouts. You see those numbers and think "Well, maybe they can win this if Iwakuma can keep it close!" Iwakuma did his part, allowing only 2 earned runs over his 5 1/3 innings of throwing the ball 60' 6" towards the plate. And then the bullpen came in. Oliver Perez was effective in his one inning of work, which is a sentence I never thought I'd type this season. He finished out the sixth inning by getting David Murphy to line in to a double play with Nelson Cruz getting doubled off third. He walked Geovany Soto to lead off the seventh, Mitch Moreland sacrificed him over to second and that was the end of the night for Perez, having thrown 14 pitches. Josh Kinney came on with one out in the seventh and got Ian Kinsler to pop in to a double play with Soto getting thrown out at third. Kinney started the eighth inning, gave up a double to the powerful* Elvis Andrus and was promptly lifted for Lucas Luetge. From that point, it got a little ugly for the Mariners. Luetge was brought in to face the left handed hitting Josh Hamilton and forgot he was supposed to get Hamilton out and not just throw things at him. Hamilton doubled in Andrus, Luetge intentionally walked Adrian Beltre to set up the double play and Wedge went to the mound to take the ball from Luetge so he could go take a shower. It was Stephen Pryor's turn to try and end the inning. Pryor started off well, striking out Nelson Cruz looking to get the first out of the inning. He walked Michael Young to load the bases and got David Murphy to ground to second. Unfortunately, Dustin Ackley was so mesmerized by the ball's perfection, he promptly threw it where nobody could get to it to preserve the ball's purity. By doing that, everybody moved up a base, scoring Hamilton and keeping the bases loaded. Pryor was feeling left out and gave Soto a pitch he could do something with, allowing the Rangers to add another two runs, making it a 6-1 game at that point. Pryor then walked Mitch Moreland, struck out Ian Kinsler and Elvis Andrus did his thing by lining a triple into the gap in right center, giving the Rangers a 9-1 lead heading to the ninth. Shawn Kelley made a brief appearance, getting Josh Hamilton to fly out for the last out of the eighth. On the offensive side of the ball, the Mariners were, well, offensive. The fireworks came from two Kyle Seager doubles, one off of Darvish and the other off of Michael Kirkman. Michael Saunders checked in with a solo home run in the top of the ninth, also off Kirkman, to make it a 9-2 game. Jesus Montero added a pair of RBI, one coming on a sacrifice fly, the other scoring Seager on a single in the top of the ninth, giving us a final score of 9-3 Texas. The second game featured aforementioned Jason Vargas and Scott Feldman. Knowing the Rangers lineup and the way Vargas has pitched on the road, it didn't look terribly promising before the game. On paper, the Mariners were already behind. This game is why they actually play. You just never know. That and these guys make millions of dollars to play baseball, so building a team on paper and going by that isn't the best of ideas. Which would be difficult since you'd never know how good or bad a player was. Still, Vargas did about what was expected of him on the road, giving up 4 earned runs on 6 hits in 5 2/3 innings with 3 walks and 4 strikeouts. Not exactly eye-popping, but we wouldn't want to be blind anyway. On the other side, it was actually a lot worse. Feldman ended his night lasting only 2 2/3 innings, giving up 6 earned runs on 7 hits, 2 walks and 2 strikeouts. As you can imagine, the offense had its day. Every starter except Olivo (anybody surprised?) had at least one hit. Actually, most of them only had one hit. Saunders and Justin Smoak had 2 and 3 hits, respectively. One of Saunders' hits was a triple off of Feldman in the top of the third to put two runs on the board. By then, the score was 4-0 thanks to a Saunders RBI single in the first and an Ackley solo homer in the top of the third. Smoak added another run in the top of the third with an RBI single and Eric Thames joined the RBI party with a single in the same inning to make it a 6-0 ballgame. From there, the wheels came off the cart for the Mariners. 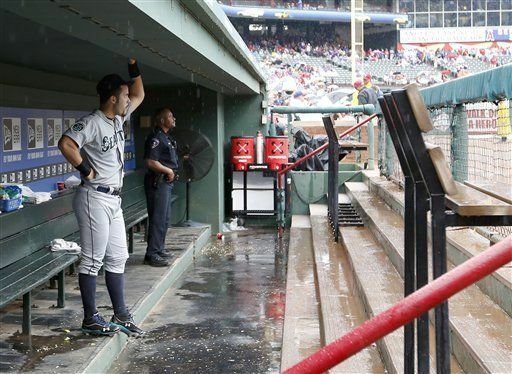 On the offensive side, Seattle was kept hitless through the seventh inning. On the pitching side, Vargas gave up a sacrifice fly to Nelson Cruz in the bottom half of the third to make it 6-1. Not too bad so far for Vargas. In the sixth, Vargas got himself into a spot of trouble. After a single and a double to put runners on second and third, he got David Murphy to pop out to left field. In stepped Mike Napoli. Napoli had been activated hours before the game and boy did he make a splash, launching a three run homer off of Vargas to get it to a 6-4 game in the bottom of the 6th. Vargas recovered to get Jurickson Profar to fly out to center and was then relieved by Shawn Kelley. Kelley ended the 6th by getting Ian Kinsler pop out to right. He got Elvis Andrus to pop out to start off the bottom of the seventh, and then got himself into a pickle. Kelley walked Hamilton, gave up a hit to Beltre and Nelson Cruz brought home a run with a single into left, scoring Hamilton from second. Kelley uncorked a wild pitch to put the runners on second and third, with Wedge electing to intentionally walk Michael Young to load the bases and keep the double play possibility in order. Lucas Luetge was brought in to face the left handed hitting David Murphy. Luetge go the grounder he wanted but in a spot where the infield had no shot to turn the double play, allowing Beltre to score and Cruz and Young to move up to second and third. For the second time in the inning, a batter was intentionally walked to set up the force. Given that the batter was Mike Napoli and the on deck hitter was Jurickson Profar, I have no complaints. Profar grounded into a fielder's choice, but the damage had been done. The game headed to the top of the eighth with the score tied 6 all. In the top of the eighth, Smoak led off the inning against some guy named Tanner Scheppers, who is apparently a major league pitcher. Smoak decided for a little payback against his former team, hitting a solo shot off of Scheppers to make it 7-6 in Seattle's favor. As a side note, Smoak is hitting .281 with 4 home runs and 11 RBI against the Rangers. Against the rest of the league? .186 with 12 bombs and 34 RBI. In the bottom of the eighth, Josh Kinney, Charlie Furbush and Tom Wilhelmsen combined to allow one hit, an Elvis Andrus single off of Kinney. With Wilhelmsen getting the final out in the eighth, he'd be going for the four out save. Now the Mariners were looking for an insurance run or two to allow all us Mariner fans to breathe. If you haven't up to this point, you're probably not reading this any more because you'd be dead. Maybe I should've mentioned it earlier. After a Jaso single and a Saunders walk, it was Smoak's turn to try and get his RBI total to three for the game. He did just that, driving a single to right to score Kawasaki, who had been pinch running for Jaso. The inning ended with no more offense from either side, with Wilhelmsen shutting the door and adding a couple of bolts and maybe a chain on there, just to make sure the Rangers couldn't get in and damage the fine China. The last game was fairly uneventful compared to the first two, so brief this one shall be. Blake Beavan was again Beavanesque in his start, going 7 innings while allowing two earned runs on seven hits, one walk and two strikeouts. Against the Rangers, two strikeouts for him might net him a treat when he gets home. The two runs the Rangers scored were on an Adrian Beltre home run in the bottom of the fourth and an RBI double by Mitch Moreland, scoring David Murphy. For the offense, there were a few single for the Mariners. In fact, they had 5. What's that you say? The box score said they had six? Why yes, yes it does. I'll get there. Patience my good man/woman. For Texas, Matt Harrison went 8 2/3 strong innings, allowing 1 earned run on 6 hits, one walk and five strikeouts. The only run for the Mariners came on a solo jack by Justin Smoak in the top of the eighth. Told you this one would be brief, didn't I? This game's recap, not the whole thing.